Blakesburg Iowa 2-8-83 Mr G.S. Finney I Have Just recd your letter of 25 ult. After so long a time, you say that you had recd two letters from me. My last letter you had not recd. It was in relation to the sale of your place. I wrote you I had recd 200$ on the sale, & the ballance 1800$ will be paid 1st of march. The money can be sent you by check any time, the ballance as soon as recd. 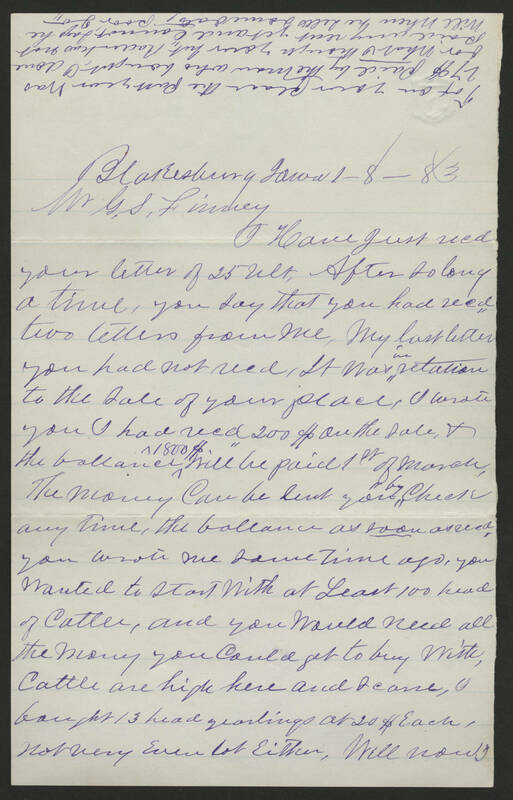 you wrote me some time ago, you wanted to start with at Least 100 head of cattle, and you would need all the money you could get to buy with. Cattle are high here and scarce, I bought 13 head yearlings at 20$ each, not very even lot either. Well now I [Written across top of this page:] Tax on your place the past year was 27$ paid by the man who bought. I done for what I though your Int. Rader has not paid any rent yet and cannot. says he will when he sells some oats, poor Jo.